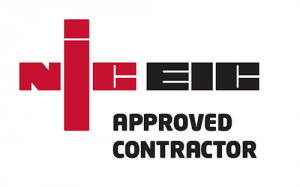 Home → Electrical Contractors → Avon Electrical are fully NIC EIC approved contractors. We are NIC EIC approved and their Platinum Promise provides you with peace of mind. The NIC EIC Building Regulations Schemes Platinum Promise is a guarantee provided to their valued customers that NIC EIC approved contractor’s installation work is done in a conscientious and safe manner in your home or place of business, and that it will meet or exceed all required building and safety regulations. As the number one voluntary regulatory body in the UK for electrical contracting, NIC EIC has been responsible for the assessment of electricians’ professional competence for well over a half-century. They presently oversee a group of over 26,000 registered contractors. This kind of experience and dedication to professionalism and safety, means that under the Platinum Promise customers can be sure that they will be fully protected in the event that any installation work done by a NIC EIC-certified contractor fails to meet all required installation regulations and building standards. Should any issues arise, NIC EIC will fully support it’s customers and guide them through the resolution process in order to ensure that all work is done correctly or is corrected where necessary. If the work was done by a NIC EIC-approved contractor in good standing with NIC EIC at the time the work was completed. Completion of the work took place within the last six years. Should the NIC EIC-registered contractor who originally performed the work no longer be available to make the necessary corrections or to re-do the original work, NIC EIC will commission remedial repair/replacement work in order to bring the work up to compliance by employing an alternate contractor up to a maximum of £25,000 cost. NIC EIC is the perfect choice for both domestic and commercial needs as their services are regulated and guaranteed. Registered contractors are authorized to work with the Local Building Control Body to certify their work personally, saving the customer both time and money when work requires Building Regulations notification. All NIC EIC-registered contractors are routinely assessed for competency and ability to meet all necessary codes of practice, safety and technical standards, and rules of the Schemes for which they are registered. The Platinum Promise means that if the customer is dissatisfied with the work performed by an NIC EIC-registered contractor and the work is also deemed unacceptable by NIC EIC, it will be corrected right away. It is the goal of NIC EIC to see to it that all of it’s customers are completely satisfied upon initial completion of any work performed. However in the event the quality of the work comes into question, NIC EIC will take the customer’s complaint, investigate and assess the work independently, and take all necessary measures to see the work corrected or re-done as the situation calls for. It will never be necessary for a customer to turn to an outside source to obtain the top-quality work they are guaranteed by the NIC EIC and it’s Platinum Promise. Customer satisfaction is the main focus and NIC EIC’s stellar reputation and 50+ years of service place them head and shoulders above the rest to verify this fact.